Creative Think: Don't Try This in Venezuela! In October, I'll be doing several large public seminars in Caracas, Venezuela. The audience will be primarily business people, entrepreneurs, and creatives. Today I heard from my Venezuelan host asking me if I could possibly wear a different color beret to represent the artist. "No problem," I said. "But what's the reason?" 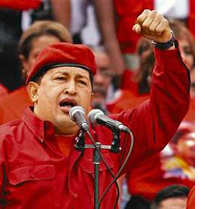 It turns out that the head attire of Venezuela's Presidente Maximo Supremo Hugo Chavez is a red beret! Indeed, the red beret is a glorious symbol of Chavez's revolution. I said that I would be happy to use a black beret. I'm really glad I was warned. I can just imagine myself mindlessly donning a red beret in front of 1,500 entrepreneurs in Caracas, "Put this hat on to think like an artist. It will get your creative juices flowing." It would have been like wearing a sheet to an NAACP convention. I'm curious, though. If you weren't warned ahead of time (and thank God you were), how would you have handled the discomfort in the room? How do you think they might have reacted? Cam: This part comes about 40 minutes into this particular presentation (which gets more serious as it goes on). That means there was some light-hearted and off-beat stuff earlier on. Had I worn a red beret, I'm sure part of the audience would have been politely amused at my not knowing it was Chavez's symbol. As for the rest, I don't know. From what I've been told, Chavez is not a "crowd-favorite" with this audience. Western Art is one of the biggest segments of the creative arts in America. How about wearing a cowboy hat in honor of our native creativity (white, of course!)? 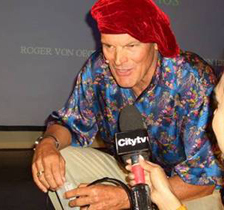 Roger: I'd wear the red beret. Then stand at the podium and talk for the next eight hours straight, not letting them leave the room. I think that might make them feel more at home. On a slightly more serious note, cultural sensitivity is a key piece of the puzzle. Screw it up and you may not get a visible reaction -- but you'll get a reaction (and one you'll only understand later). If you're going into a meeting with Apple, bring a Mac. Even if you don't own one. Borrow one. Learn how to turn it on. Bring it out in the meeting, even if you don't have to use it. It matters. We prefer to do business with people who we know and like and who are "like us." Showing you're oblivious never wins new friends. Stephen: "talk for the next eight hours straight." That's a good one. I knew Castro used to go on four or five hours at a time. Eight hours requires a lot of stamina. Funny. What's great in one place is dangerous in another. If [or probably] Chavez wears a red beret it's probably because of the red flag for communists; the black flag is the anarchists' flag - so if anybody realised you were wearing a different colour than normal for political reasons (ie - not to upset the group you were about to give a talk to) then if they knew the significance of black it might have either a. made them wonder what your politics are [in the grander scheme] or b. find it rather humourous as after the spat between Marx and Bakunin anarchists and communists have had an, er, interesting relationship (with very real consequences in Spain 1937-8)... with each other.